2019 GAS GAS ECRanger 300. Picture credits - GAS GAS. Submit more pictures. 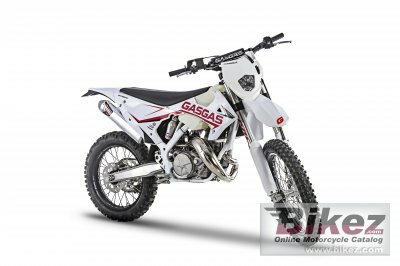 GasGas brings back the spirit of adventure of its legendary Pampera, adapting this go-anywhere bike to the demands of today�s riders with the new ECRanger. Light, docile and above all easy to handle, suitable for any type of rider, this is the new bike from GasGas. The ideal formula for all those who love �light enduro� and �trail excursion� and want to enjoy off-road riding like never before without sacrificing the comfort of the new generation of off-road motorcycles. Ask questions Join the 19 GAS GAS ECRanger 300 discussion group or the general GAS GAS discussion group. Enter your e-mail to join the 2019 GAS GAS ECRanger 300 forum and get notification of answers and new messages about this bike. You can unsubscribe with a single click. Bikez does not display, sell	or misuse e-mail addresses. Bikez has discussion forums for every bike. View comments, questions and answers at the 2019 GAS GAS ECRanger 300 discussion group. You can sign up for e-mail notifications when other riders answer you. If you have extensive experience with the MC, please send us a review. If you consider buying this bike, you should view the list of related motorbikes Look at photos. Compare technical specs. And check out the rating of the bike's engine performance, reliability, repair costs, etc. You can compare the rating with other bikes.